Disclaimer: The information contained within this blog post does not constitute medical advice and is for informational purposes only. While I have a PhD, I am not a licensed medical professional. Any questions you have regarding your health should be discussed with your treating physician. Also, the experience described below is my experience only. Just because the medication didn’t work for me, doesn’t mean it won’t work for you. I’ve debated for a long time on whether or not I should write this post. By writing this post, I am choosing to let people in on my medical history, which might come back to haunt me and it might affect my future job prospects on account of discrimination against those with mental illness. 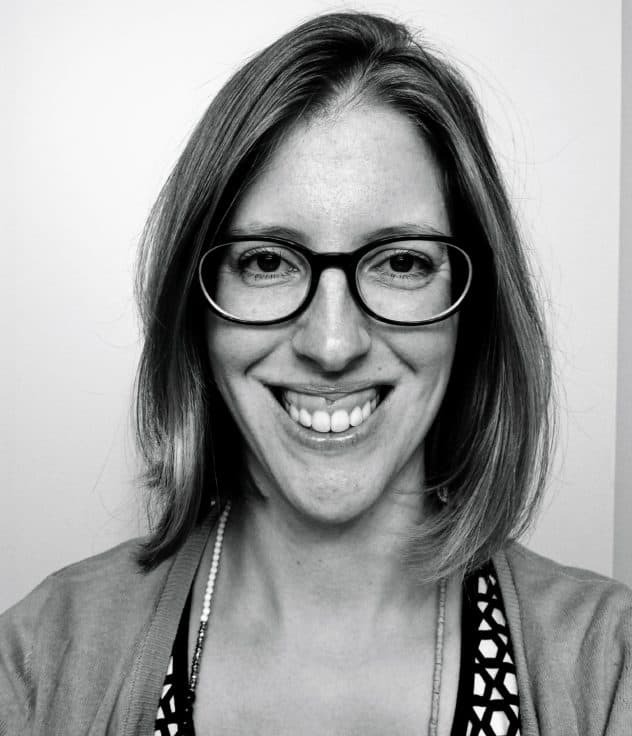 But at the same time, I feel that there are not enough open and honest discussions of psychiatric medication experiences, particularly with what to expect going on the medication and how to safely get off. So in the end, I think the positives outweigh the negatives in sharing my experiences on mirtazapine, so I am going to go forward with it. 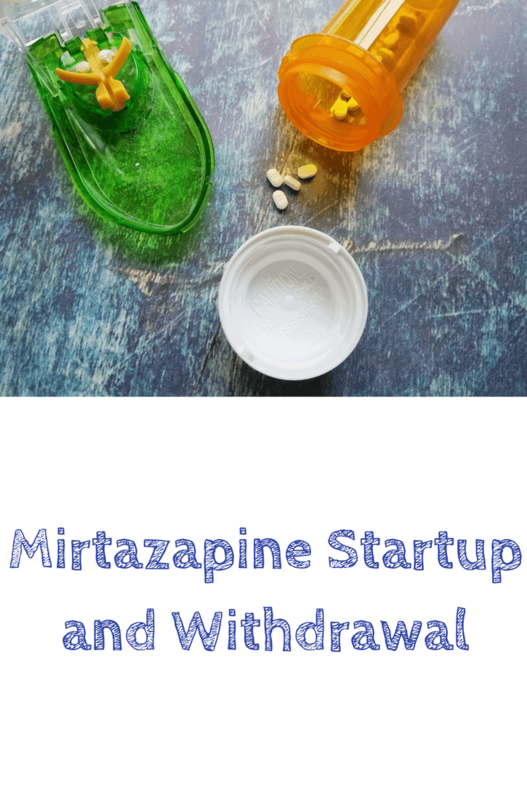 In this post I will discuss my reasons for choosing mirtazapine (Remeron); the startup, long-term, and withdrawal side effects; and my tapering schedule. When I was first in the market for choosing a medication for my anxiety, I had four choices available to me from my psychiatrist: escitalopram (Lexapro), duloxetine (Cymbalta), mirtazapine (Remeron), and amitriptyline (Elavil). A note on the conventions: the name outside the parentheses is the generic name and the name inside the parentheses is the brand name. After a nasty experience with the fluoxetine (Prozac) prescribed by my primary care doctor, I immediately wrote off trying any other selective serotonin reuptake inhibitors (SSRIs) which meant that escitalopram was out of the question. Regarding duloxetine (a serotonin and norepinephrine reuptake inhibitor or SNRI), I had heard multiple horror stories of start-up and withdrawal side effects so I steered clear of that one. This narrowed down my choices to mirtazapine (a noradrenergic and specific serotonergic antidepressant or NaSSa) and amitriptyline (a tricyclic antidepressant or TCA). After scouring through the scientific literature for adverse events and side effects, I settled on mirtazapine because it was safer than amitriptyline from a cardiotoxicity standpoint [1-5]. Going on mirtazapine was a cake walk compared to the SSRIs that I tried. The only start-up side effects that I had were stomach pain, burning eyes, dry mouth, and extreme fatigue (I slept for 40 hours in 3 days). These startup side effects only lasted about a week or so. Every night when I would take it, within an hour, I was out cold sleeping like a log. I am generally a light sleeper and take a long time to nod off, so this was a very welcomed side effect. If you are about to start this medication, then check these 12 tips for starting new medications. These got to be pretty intense. I remember a few nights they were so bad, that I actually had to lock myself in my room, chew on a piece of gum, and distract myself so that I wouldn’t stuff my face! Thankfully for me, this was only 6-8 pounds. Some, but not all of it, came off when I discontinued the medicine. I am not sure if it has permanently altered my metabolism and/or if I am just not as active as I used to be (my new medicine also makes me tired). I wrote a separate post on how I kept my antidepressant induced weight gain under control. This was annoying. I would be sitting and watching TV when all of a sudden one of my hands would randomly jerk. I think mirtazapine has a weak affinity for dopamine receptors , so this was likely the cause. This was obnoxious. I would wake up in the morning and instead of feeling refreshed, I just wanted to keep sleeping for the rest of the day. It would generally clear up by the afternoon, but it was never completely gone. I am not sure if the mirtazapine caused this, or if this was just due to my anxiety not being taken care of by the medication. I still have dizzy spells on my new medication, so I am leaning more towards it being anxiety driven. This persisted all day long unfortunately. I would feel it the most when I went running, or when I went to go and do a cardio workout. Again, this might be anxiety related but I noticed my short-term memory was going. Mirtazapine does hit the histamine receptors like a benadryl , and benadryl is known for its long-term detrimental effects on memory. After reading that this could be a potential side effect, I made sure to get my cholesterol levels checked before I went on the medication and also while on it. While the numbers were within the normal limits, they definitely were not good. Once the mirtazapine is cleared out of my system for a while, I will have my levels retested to make sure they went back to baseline. I never quite figured this one out. I never read anywhere that mirtazapine could interfere with blood sugar levels but that is the only thing I could think of that would cause something like this. Thankfully this mostly went away when I came off of it. This is a side effect I actually enjoyed. I hardly ever remember my dreams, but thanks to mirtazapine, I remembered them pretty well. Now, I am not prone to nightmares so the dreams were mostly pleasant, with some that were a bit odd. If you are prone to nightmares, this might end up being a really scary side effect for you. The tapering schedule shown below is what I used to successfully taper off of the medication. It is one I devised and ran by my doctor before executing. I was initially told I could just stop at 7.5 mg with no ill effects, but knowing that I am sensitive to psychiatric medications, I decided to go with a more conservative tapering schedule. As you work through it, you will see that there was a period of about a week where I was completely off mirtazapine but then had to reinstate at the previous dose. I had to do this because the withdrawal side effects were debilitating. It is important when tapering that you listen to your body. You should still be able to fully function while tapering off of a medication. If you can’t, then you are tapering too fast and you need to talk to your doctor about possibly revising your tapering schedule. If you were to add up all of the numbers here, you would see that my taper took 105 days. In hindsight, even my adjusted tapering schedule was fairly aggressive. The current recommendation is to taper no more than 10% a week. Shown below is a graphical representation of the tapering schedule I used versus what the recommended schedule is. The blue line corresponds to the part of my taper when I was in the pill cutting stage. The red line corresponds to the part of my taper when I was using a liquid formulation compounded by a special compounding pharmacy here in the US. 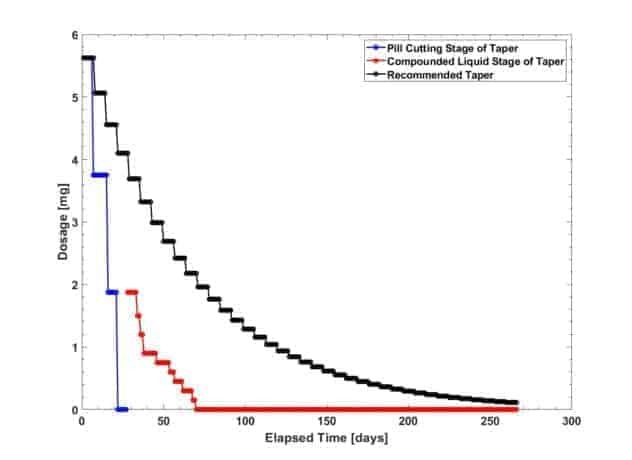 The black line corresponds to the recommended tapering schedule. The time difference to 0 mg of mirtazapine between my tapering schedule and the recommended tapering schedule is 195 days, or roughly 6.5 months! And this is to just taper off of 7.5 mg. This would generally happen a few days after a dose decrease, but only in the pill cutting phase of the taper. Then, once completely off the medication, I experienced a surge of anxiety that would not dissipate. I am not sure if this was because my brain chemicals needed to find a new equilibrium or if the original problem had returned. Regardless of the cause, I increased the dose of my new medicine to calm it down. It may have since subsided, but I decided to keep the dose of my other medication at the higher level for the time being. Because mirtazapine acts on the histamine receptor (e.g., acts like a benadryl), it makes sense that when coming off, you are going to itch. And itch I did, all over. It was most persistent on my scalp, arms, and legs. It was severe enough that I would bleed at times. It was horrible. Regular application of lotion did nothing to alleviate it. The only thing that helped was to take a cold shower or apply cold compresses if the itching was local. The other type of itching I experienced, which only happened once I was completely off the medication, was itching when I exercised. This was severe enough that I would have to cut my exercise short and run home and take a cold shower. Thankfully this eventually stopped. This is unfortunately an ongoing issue with me. Again, because it acted like a benadryl and knocked me out at night, my body became dependent on it for sleep. It was at its worst right when I came off of the medicine. I had trouble drifting off to sleep and then I would wake up in the early morning hours because of nausea or I would wake up at 5 am because of the sunrise and chirping birds. My sleep seems to be much more easily disturbed by external factors like noise and sunlight. I have since remedied these things for the most part with a sleeping eye mask and some ear plugs. As for drifting off to sleep, I’ve had to practice really good sleep hygiene. I will be writing up a separate post on that, so stay tuned. This could be from the medication or because of unresolved anxiety. It just seemed like I had trouble thinking and concentrating. My head wasn’t as clear as it used to be when I wasn’t on any medication. When I went off the medication the first time, this is what drove me to reinstate. The nausea was HORRENDOUS. Not even Zofran could touch it. I am on the thin side to begin with, so the rapid weight loss that ensued from not being able to eat was worrisome. After doing a slower taper, it was much more manageable. It would come in waves as opposed to being present 24/7. Because of this, it was easier to combat using Tums and Zofran. Of course sometimes it would come at an inopportune time like in the middle of the night, and I wouldn’t be able to get back to sleep. What I found also helped, was drinking ginger tea on a regular basis. Ginger is an antiemetic, which means it will help in the prevention of nausea and vomiting. After checking the ingredient lists of several brands, I settled on the Harney and Sons Ginger Tea because it was the only one that had real ingredients. You can also make your own at home with fresh ginger. I am not sure why the nausea happens upon withdrawal, but my suspicion is that it has to do with mirtazapine’s strong antagonist effects on the 5-HT2 and 5-HT3 receptors, some of which affect the GI tract. Naturally, this came about as the result of the nausea reaching the tipping point. I never actually vomited, but I clutched a bucket pretty tightly for a few weeks. This also comes with the territory of just general GI disturbances. Basically, you can expect a lot of GI disturbances coming off of mirtazapine. From the forums I am a part of, this seems to be a common complaint when coming off in addition to the severe nausea. At the height of my nausea experiences, I had some pretty bad chills. I would fluctuate between shivering so badly that I needed to be under a pile of blankets to being so hot, I wanted nothing on my body. I checked my temperature and it was fine, so I chalked it up to withdrawal. Thankfully, this passed pretty quickly (a day or two). When I was in the pill cutting stages, after the first drop from a whole pill down to a 3/4 of a pill I experienced what felt like electrical shock sensations traveling up my arms. They were pretty painful, but not so bad that I couldn’t just ignore them. These lasted only for 2-3 days. Now, the more concerning pain was the bone pain I had. It was in my foot and above my left elbow. That was excruciating. One night it woke me up out of a sound sleep and I was writhing in agony and massaging the areas to try and relieve the pain. Nothing worked, so I just had to wait it out. Thankfully, that only lasted 2 days. So, this one I only figured out what it was after I googled the symptom I was experiencing. Basically it felt like the electrical shock sensations traveling up my arms, but in my brain. They were pretty intense and hurt quite a bit. I didn’t experience these until I had been off of the medicine for some time, and they lasted about 5-7 days. It is important to note here, that because everyone’s body and genetic makeup is different, the withdrawals will also vary from person to person. I am part of a mirtazapine support group on Facebook, and there are several people on there that report having no withdrawals, despite tapering really quickly. There are also people like me on there, who have a horrible time getting off mirtazapine. And then there are also people that aren’t able to get off mirtazapine at all, due to chronic severe withdrawal side effects. 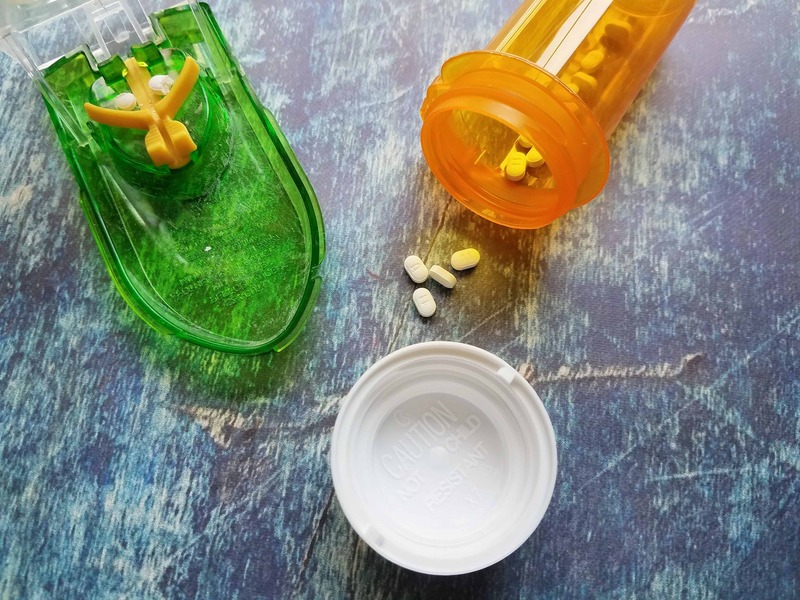 It’s important to keep in mind that yes, while most medications will be eliminated from the body within a week or two (depending on the medication half-life), the changes of the brain and of the body occur on a longer time scale. To the people who would tell me it was all in my head, I would kindly reply back that antidepressants generally take 3-4 weeks to notice any benefit and 6-8 weeks or even 8-12 weeks to reach full efficacy. So, it would be reasonable to assume that withdrawal, if present, should occur on a similar time scale. The bulk of my withdrawal effects from tapering the second time occurred within weeks 1-4. I still struggle with insomnia and nausea from time-to-time, and I am hoping these fade with time. I hope those of you that are interested in starting or discontinuing mirtazapine find this post useful. The intention of this post wasn’t to scare people away from trying it, as this medication has been a game changer for many people for a whole range of conditions ranging from non-psychiatric conditions (e.g., insomnia, appetite stimulant) to psychiatric (e.g., anxiety, major depressive disorder). I felt it was important to give an honest account of my experience, in case someone else was going through something similar. At the end of the day, you need to listen to your body and perform a risk/benefit analysis of the medication with your doctor. For me, the risks of this particular medication outweighed the benefits, so it wasn’t worth continuing. After genetic testing, I have since transitioned to a different medication that has been much more effective in helping my anxiety. Smith, Ward T., et al. “Mirtazapine vs. amitriptyline vs. placebo in the treatment of major depressive disorder.” Psychopharmacology bulletin (1990). Montgomery, S. A. “Safety of mirtazapine: a review.” International clinical psychopharmacology 10 (1995): 37-45. Fawcett, Jan, and Robert L. Barkin. “Review of the results from clinical studies on the efficacy, safety and tolerability of mirtazapine for the treatment of patients with major depression.” Journal of affective disorders 51.3 (1998): 267-285. Watanabe, Norio, et al. “Safety reporting and adverse-event profile of mirtazapine described in randomized controlled trials in comparison with other classes of antidepressants in the acute-phase treatment of adults with depression.” CNS drugs24.1 (2010): 35-53. Davis, Rick, and Michelle I. Wilde. “Mirtazapine.” Cns Drugs 5.5 (1996): 389-402. Thank you so much for posting this. As an avid researcher of Mirt’s side effects (in the midst of an entertaining taper) I can humbly admit this is one of the most thorough, candid and valid posts on one’s experience with Mirt. The graph/visualization with the taper schedule/survival curve is impressive as well. Curious where you found the liquid mirt? I am currently on 3.75mg and don’t think I can go much lower with the actual pills. P.S. You should be my psychiatrist because this post helped 10x more than my current MD. Hi David! I’m glad you found my post helpful. I was worried about sharing such personal information, but this post actually turned out to be my top performing post! I am not sure what pills you have, but I had 7.5 mg pills, and was able to roughly cut that into quarters. If you have the same pills, you can likely get one more taper step out of them. As for the liquid formulation, where you get it depends on your geographic location. I believe in the UK they have a liquid version readily available without the use of a special compounding pharmacy. If you are US based, you have to ask your doctor to send a script to a compounding pharmacy and they will make a suspension for you. What they basically do, is grind up the mirtazapine and suspend it in a liquid. Which means you can also ask the compounding pharmacy to use the same pill manufacturer used on your current pills to maintain consistency (it should say on the bottle). And yes, from what I’ve heard from others, a lot of doctors are not well versed in how to properly taper a patient off of these types of medications. To be fair, the literature actually really say there are withdrawals for mirtazapine. A few case studies started coming out on it showing withdrawals, and I hope a more comprehensive study about mirtazapine withdrawals is completed soon (I should just do it myself!). And the doctors use these studies as a guideline, along with other guidelines that suggest a rather fast tapering schedule imo. Like I always tell people, finances and health insurance permitting, you are in control of your taper at all times. Always check your proposed taper schedule with your doctor, but you can taper at whatever speed works with your body. For me, I had to slow it down because it became debilitating. Also, if you’re not a member already, the Facebook group I linked in the article was a great support group for me when I was doing my taper. Best of luck, and let me know if you have any other questions! Thank you for writing this as it nice to read what I m going through right now. I cut from 15mg to 7.5mg a week at ago and it has been pretty grim to say the least. Can I ask which medication you have found useful? Hi Derek! Yes, Mirtazapine withdrawal is often underestimated by the medical community. While many people come off without incident, there are still many others that struggle through withdrawal. If the withdrawal is interfering with your ability to get through the day, I would request a slower taper from your treating physician. As for the medication I am on, I’m not comfortable disclosing that. But I will say that it is not a traditional treatment option. I wish you luck with your taper, and you are not alone in your withdrawal struggles!